Delivering a fleeting moment in time at a very particular place. When you look at the work of Nicholas Watts, you once again realize that painters have a unique vision of every scene, and this gives them the ability to portray their work in a way that a photographer simply cannot. To be sure, Watts has a deep respect for automotive machinery, and like a photographer, his realistic images give you a picture of what the cars really look like. Yet painting also gives him the opportunity to put the cars in context, capturing a moment in time that includes not only other cars but also the place where it happened. Through his paintings, Watts is able to tell the story that underlies the speed. available at l'art et l'automobile. Nicholas Watts is another British boy of the 1950s who grew up fascinated by cars. The fact that he lived practically within earshot of the Brands Hatch racing circuit inevitably drew him to motorsport. He started out as a draftsman at Vauxhall, which perhaps accounts for his ability to make the cars look right. He later went into the Royal Air Force as a specialist in navigation systems, which might have something to do with his dedication to making sure the details are correct. 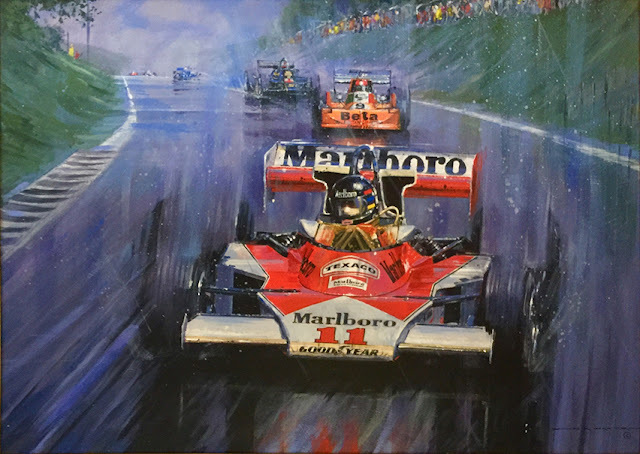 Working with both gouache on board and acrylic on canvas over the past 40 years, Watts has created an astonishing number of paintings and prints, and they cover an equally astonishing range of motorsport disciplines. Raging Bulls giclee by Nicholas Watts, autographed, available at l'art et l'automobile. In this particular painting, we see the Martini-sponsored Porsche 911 RSR 2.8 that wild man Herbert Müller and Le Mans-winner Gijs van Lennep drove to a win at the Targa Florio in 1973, the last year that this race over the mountain roads of Sicily was included in the sports car world championship. Watts gives us a scene that juxtaposes the speed of the high-tech Porsche with the slow pace of a rustic Sicilian town. The proximity of the spectators shows us the spe- cial enthusiasm that always accompanied this event, as well as the danger that nally ended it. 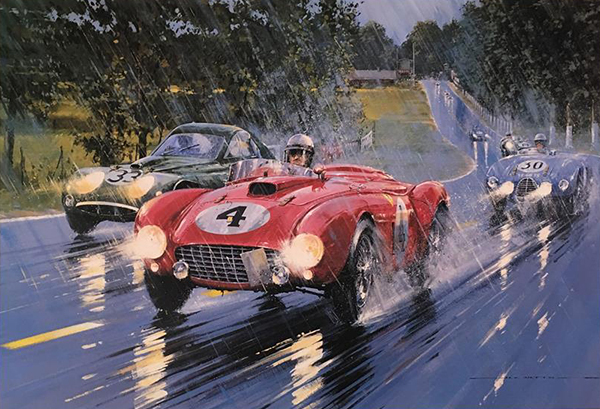 Le Mans 1954 print by Nicholas Watts, autographed by 5 drivers, available at l'art et l'automobile. The work of Nicholas Watts is available from many sources, a measure of both its enduring popularity and its relative affordability. 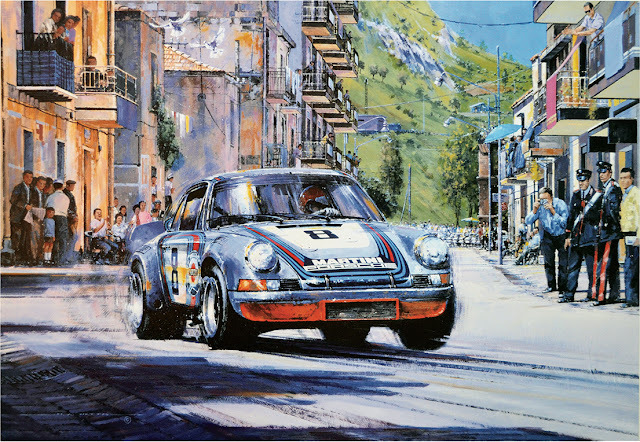 We recommend l’art et l’automobile (arteauto.com), Jacques Vaucher’s legendary outlet for automotive art and collectibles. Vaucher has been in the eld since 1975, and he virtually invented the business in the U.S. Most important, Vaucher has a personal relationship with the artists he represents, and his ongoing blog is an entertaining window on the personalities in the eld. Grand Prix of Japan 1976 acrylic painting by Nicholas Watts, available at l'art et l'automobile. Many thanks to Porsche Panorama for Highlighting Nicholas Watts and his talent, as well as the mention of us and our website. 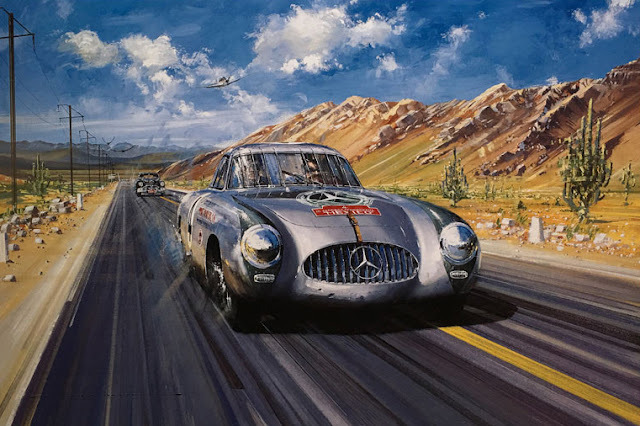 At l’art et l’automobile we have a deep appreciation for the artistry of vintage automobiles, but particularly for the artwork that celebrates them. 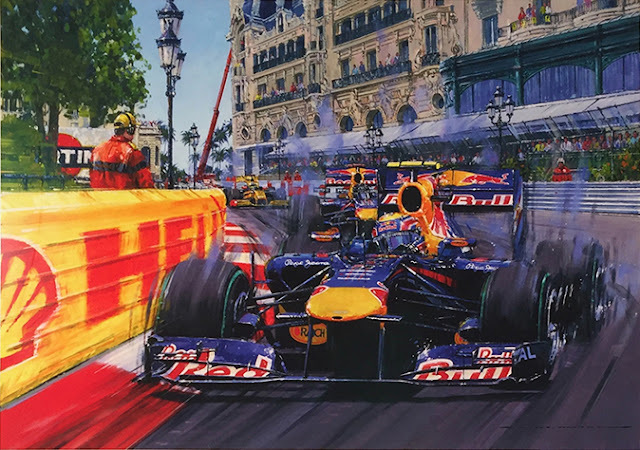 Nicholas Watts is at the forefront of this sense of dedication to capturing the automotive world through the lens of paint and canvas. To celebrate this fact, we have collected all our pieces by this wonderful artist and present them to you. 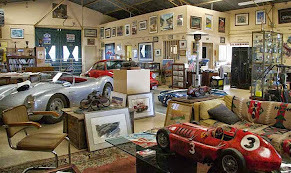 Find out more about this collection here or enjoy looking through the gallery at arteauto.com, and perhaps add a piece to your collection. For more great automotive memorabilia, don't forget to browse the many other categories on our Website. Remember we also have many more items in our gallery, do not hesitate to contact us if you are looking for something in particular. And as always, be sure to Like and Share on Facebook, Follow us on Twitter, share a photo on Instagram and read our Blogs. How Fast is the Fastest?